Kurt may not agree with this assessment, but I don’t think I have very many baking pans. I don’t have every possible size for cakes or tarts, and I really only have a few pans that are for specific things like madeleines or snowman-shaped cupcakes. Of course, I want every baking pan I ever see, and I imagine I’ll use all of them enough to justify them taking up storage space, but only very occasionally do I actually add to the small collection. I’d considered getting pans for baked doughnuts for ages, and when I saw the Cinnamon Baked Doughnuts in Barefoot Contessa Foolproof , I had to do it. In that book, the baked doughnuts are served with hot chocolate. We weren’t having hot chocolate weather when I made these, and I’d just read about several lovely chocolate sauces in Modern Sauces . So, I opted for Mexican-Style Chocolate Sauce instead of a hot beverage to accompany the doughnuts. The chocolate sauce has espresso, cinnamon, Kahlua, and some pure chile powders that give it depth and interest. Paired with the light and cakey, baked cinnamon doughnuts, it made for a delightful dessert. Making the batter for the doughnuts is as easy as it gets, but the most important instruction is to fill the doughnut cups in the pans three-quarters full. Yes, I learned that the hard way. After mixing the dry ingredients in a large bowl, the wet ingredients in a smaller bowl, and stirring the wet into the dry, don’t overfill the pans. If the cups have too much batter, you won’t have holes in your doughnuts. I got it right on my second try. After baking, the doughnuts cooled for a few minutes before being tapped out of the pans. Then, they were each dunked into melted butter and then dipped into cinnamon sugar. You could dunk and dip both sides, but I only did one side for each doughnut. The chocolate sauce is simple to make and can be stored in the refrigerator and reheated as needed. Chopped dark chocolate, or feves as I used, is placed in a bowl. Cream is brought to a simmer in a saucepan. Off the heat, sugar, espresso powder, cinnamon, vanilla extract, almond extract, Kahlua, chile powder, and a pinch of salt are added to the cream. The cream is then poured over the chocolate which is whisked until smooth. You can use whatever pure chile powder you prefer, and chipotle is suggested. Instead, I used a big pinch of ancho powder and a little bit of cayenne. You’ll want to taste and add small pinches of chile powder until you’re happy since the richness of the cream flattens out the chile flavor. I wanted a subtle earthiness from the ancho and just a slight tingle from the cayenne. It took a few added pinches and taste tests to get it just right. Serve the chocolate sauce in small cups for dunking the doughnuts or for pouring the sauce on top of them. 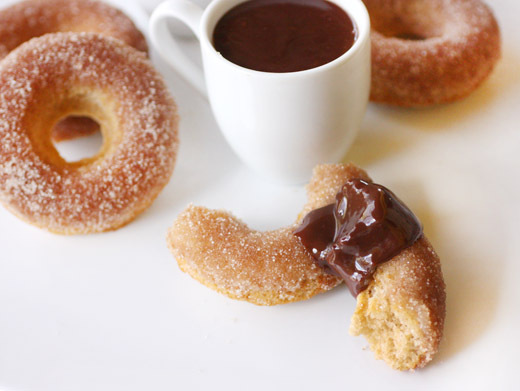 Buttery, cinnamony doughnuts are ideal vehicles for this rich and flavorful chocolate sauce. After this, I think my new baked doughnut pans will be getting plenty of use. And, now I have to ponder my lack of mini Bundt pans and possibly do something about that. Oh, marvelous! That is such a fabulous treat. Lisa you always impress me! These look amazing! I don't have many pans at all, no specialty ones, but I am already running out of space. These doughnuts look amazing! I have a TON of pans. I have used them all at some point so I can justify it :) These doughnuts look amazing - especially that sauce! The chocolate sauce -- I die! That looks amazing, especially with the cinnamon in the doughnuts. These just look irresistible, Lisa! I just purchased some mini bundt's and now have added doughnut pans to the list to dip in Mexican chocolate sauce. Oh I'd love to try this mexican style chocolate sauce. one pan i do not currently own is a donut pan. the prospect of these would definitely push that to change! Wow! They look sooooo good,Lisa! 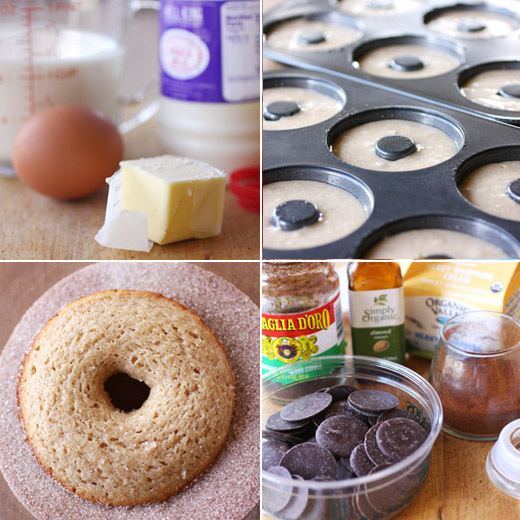 love the chocolate sauce!The donut pan is going to be on my shopping list! It's cool and rainy today. 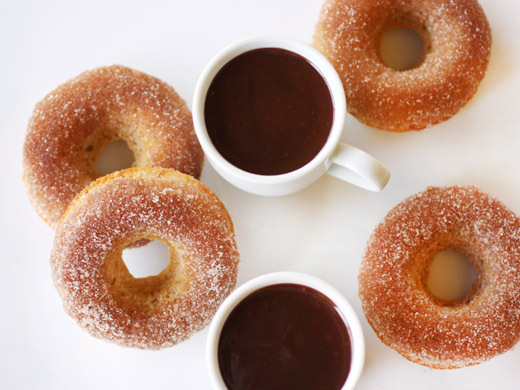 Hot chocolate and doughnuts would be a prefect treat! I confess I have purchased the doughnut pan, but not tried the recipe. After coveting your Cinnamon treats I will be baking doughnuts soon! Baked doughnuts are great. My wife has been playing with them for several months, and they're wonderful. And reasonably healthy, as far as doughnuts go. ;-) Nice stuff - thanks. What a glorious doughnut recipe! I've been mulling over the purchase of a doughnut pan as well. The recent doughnut issue of Saveur kicked the mulling into high gear. I've decided fried, homemade doughnuts aren't for me since I can never keep the oil hot enough so from henceforth, I'm sticking with baked. yours look and sound terrific! I finally got a donut pan a few weeks ago and it was definitely necessary to my happiness! Because I would have been totally depressed had I seen these and not been able to make them. I have seen so many posts of baking donut, and yet have to buy a pan for it. I like the idea of a pinch of chili...yum! Ok so now I have the urge to buy that pan and make donuts -- and can't forget the chocolate sauce. Reminds me of eating churros and thick hot chocolate in Spain. I have to try this recipe, I have the cookbook on hold and can't wait to get it. Oh. My. Oh. Lisa. Those look AMAZING!! I fell on the floor when I saw your top photo. Stunning! A donut pan for baked donuts is at the top of my Must-Buy-When-In-The-States list but will I need to buy the damn cookbook as well? I want these gorgeous donuts! You have officially sealed it for me - I need a doughnut pan. My kids love doughnuts so much and I have zero interest in frying them.